- It is the lightest weight climber. 1. The above rates are Ex-our works. 2. Packing charge will be extra which will be informed later. 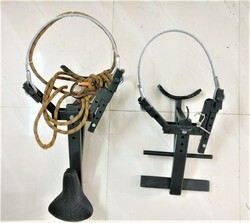 COCONUT CLIMBER MACHINE , COCONIUT CLIMBING MACHINE . This simple and easy-to-use device to climb up or down coconut palm, arecanut or other similar trees is handy for people untrained to climb up such tall trees, enabling to do accomplish the task swiftly and with ease. It can be very useful for even trained people. They can reduce drudgery, and climb faster using less energy. It can be used for gathering nuts or spraying pesticides. We are engaged in offering Coconut Tree Climber. We are the suppliers of Coconut Tree Climber in Coimbatore. We have our own manufacturing unit and we can provide the sitting and standing model type climbers. Our Climbers can bear 100 Kg weight capacity and can be used both in Coconut and Palm trees. 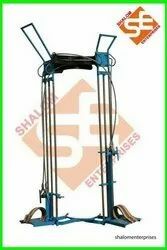 The design is developed and approved by TamilNadu Agriculture University. Orders booked with respect to stock. Normally Coconut Trees are growing up to 20-40 feet height, for harvest of nuts and other cultivation practices it needs trained persons to climb the tree. Now a days there is very less no of such a kind persons and it also includes high risk, by considering the above facts TNAU designed a simple tree climbing instrument. We are a top notch supplier of Coconut Tree Climber. We are a leading exporter wide range of coconut tree climber. - Stainless steel makes it more strong so there won't be any problem of break down of this in the mid-air. - You can carry this machine easily.